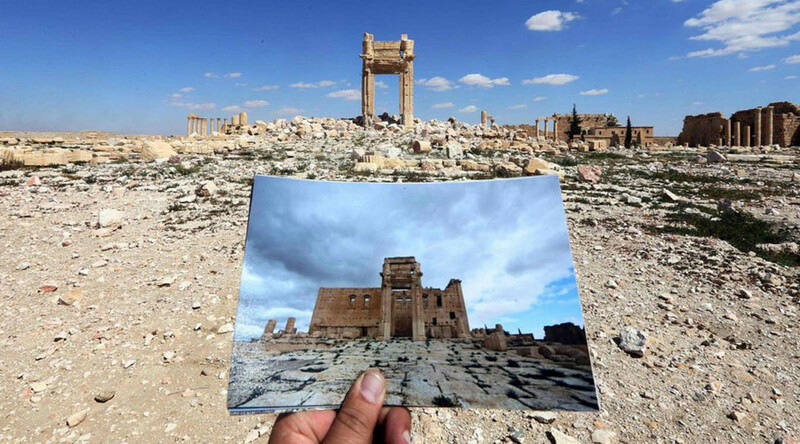 In May, 2015, ISIS militants took Palmyra, and began “…systematically destroying the city’s treasured ancient monuments” (Calderwood) until the site was retaken by the Syrian army over a year later. But that year took a heavy toll on one of the world’s most significant cultural resources. Reporting for The Guardian, feature writer Stuart Jeffries points out, “…earlier Muslims who have occupied Palmyra didn’t see fit to destroy it. Under the Ummayyad caliphate that existed in the city in the 7th century AD, part of the Temple of Bel was used as a mosque. Isis is erasing, then, not just pre-Islamic culture, but Islamic heritage, too.” In May of this year, Abu Laith al-Saoudy, ISIS commander at Palmyra, told Alwan FM, an anti-regime Syrian radio station, “Concerning the historic city, we will preserve it and it will not be harmed, God willing….What we will do is break the idols that the infidels used to worship. The historic buildings will not be touched and we will not bring bulldozers to destroy them like some people think” (qtd. in Jeffries). Nonetheless, Australian professor Ross Burns described the destruction of the Temple of Bel, remarking that it “…was blown up with great proficiency.… The only part that appears to be standing is the remarkable western doorway into the shrine, which was a spectacular entry with a richly decorated frame that sloped inwards as it rose in an Egyptian-influenced style” (qtd. in Jeffries). Fig. 1. What remains of the Temple of Bel after being dynamited. “Missing monuments: Before and after pics of Palmyra show what ISIS has destroyed.” Rt.com. TV-Novosti. 3 April 2016. Web. Dec. 15 2016. Fig. 2. The destruction of the Temple of Baalshamin. Coghlan, Tom. “Isis shows destruction of ancient temple.” The Times. n.d. Web. 15 Dec. 2016. The casualties at Palmyra are not exclusively those of the historical and archaeological record. In August, ISIS decapitated Khaled al Asaad, the 81-year-old former director of the archaeological site at Palmyra. His body was hung on a column on one of the city’s colonnaded streets (Shaheen and Black). This was in more-or-less equal parts due to his affiliation with Bashar al-Assad, president of Syria; his management of the so-called “idols” at Palmyra; and for his failure, even when tortured, to provide details of the site’s most valuable antiquities, which ISIS would see sold on the black market, a hypocritical crime which ISIS has committed frequently over the past five years (Jeffries; Shaheen and Black). In July of 2015, ISIS took to the Roman Theater at Palmyra, producing a video of “Child executioners … being forced to brutally slaughter a group of more than 25 regime soldiers (Calderwood). Fig. 4. Crowds watch as ISIS child executioners murder 25 Syrian regime soldiers. “Slaughter in the Roman Amphitheater.” The Daily Mail. 5 July 2015. Web. 15 Dec. 2016. Since the Syrian army’s recapture (discussed below) of the site, “…a mass grave containing more than 25 bodies including women and children” has been uncovered (Wintour). There is, however, the possibility that one of the casualties in the conflict may have prevented Palmyra from having been leveled into dust: “It also emerged that a plan to detonate 4,500 improvised mines that were linked to the telephone network was not carried out because the man responsible for triggering the explosions was killed by Assad loyalists working undercover” (Wintour). In a more recent publication, The Guardian’s diplomatic editor Patrick Wintour quoted Syrian Director of Antiquities Mamoun Abdulkarim as claiming that “…at the time of the capture of the desert town by Isis … many of the most important works had been transported to government-held Damascus, and some of the remaining statues were reproductions” but added that some Roman sarcophagi exhibiting relief sculpture were left behind, having weighed several tons each. In April, taking account of the contents within the site’s museum, it was discovered that the destruction “…appears to have been devastating, with wanton disregard for the archaeological and cultural value of the artefacts. Tombs have been broken open and heads systematically removed from statues” (Wintour). Fig. 5. Mutilated statuary at within the museum at Palmyra. Eid, Joseph. 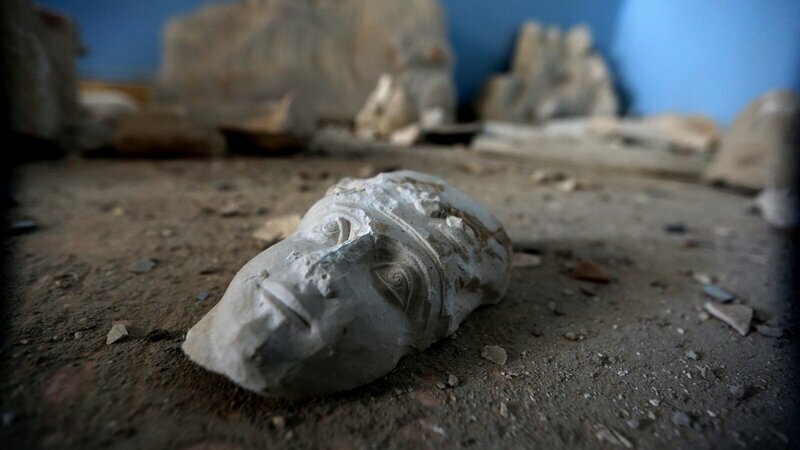 “In Palmyra, Islamic State Left Behind Mass Grave, Destroyed Monuments.” npr.org. NPR. 2 April 2016. Web. 15 Dec. 2016. In March of this year, CNN reported that “Syrian forces recaptured Palmyra from ISIS on Sunday, months after the city fell to the Islamic extremist group, state media reported” (Hutchison and Karimi). Since, UNESCO has laid plans to evaluate the damage, once security conditions allow, referring to the temples’ destruction as “a war crime” and assuring that “…those responsible for the destruction will be punished” (qtd. in Hutchison and Karimi). Editor of British Archaeology Mike Pitts expressed the sentiment that best encapsulates the futility of jihadis’ destruction: “Isis has chastised archaeologists for digging up the past. Yet it cannot stop that happening. And no amount of physical destruction can remove the knowledge of mixed cultures, creative thinking and love of beauty that bequeathed a desert ruin. In the face of heritage, at the end of the day Isis is powerless” (qtd. in Jeffries). Calderwood, Imogen. 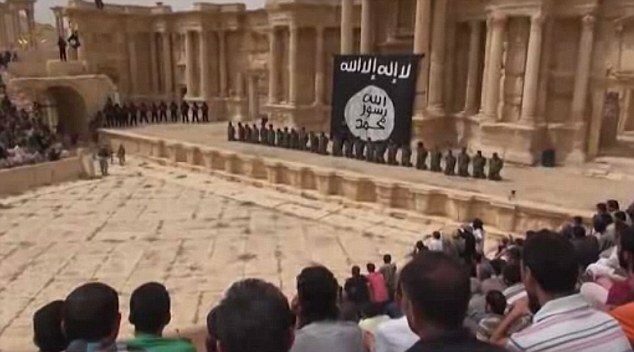 “Slaughter in the Roman Amphitheater: Horrific moment ISIS child executioners brutally shoot dead 25 Syrian regime soldiers in front of bloodthirsty crowds at ancient Palmyra ruin.” dailymail.co.uk. The Daily Mail 5 July 2015: n. pag. Web. 15 Dec. 2015. Hutchison, Kimberly and Faith Karimi. “Syrian forces capture Palmyra city from ISIS militants, state media reports.” cnn.com. CNN. 28 March 2016: n. pag. Web. 15 Dec. 2016. Jeffies, Stuart. “Isis’s destruction of Palmyra: The heart has been ripped out of the city.” theguardian.com. The Guardian 2 Sept. 2016: n. pag. Web. 15 Dec. 2016. Shaheen, Karim and Ian Black. “Beheaded Syrian scholar refuses to lead Isis to hidden Palmyra antiquities.” theguardian.com. The Guardian 19 Aug. 2015: n. pag. Web. 15 Dec. 2016. Wintour, Patrick. “Isis destruction of Palmyra antiquities revealed in new pictures.” theguardian.com. The Guardian 1 April 2016: n. pag. Web. 15 Dec. 2016.